Are you planning a product launch? How is your marketing plan looking? If you’re looking for some tips, then you’ve come to the right place. We’ve helped startups launch new products over the years, and today I’m going to share three of the most successful methods I’ve seen. Just for a second, I want you to think about your general fitness and strength. If you are a little out of shape, what’s the one thing you can do to improve it? Strengthening your core is the perfect start, because it affects nearly every other part of your body. Now let’s apply that analogy to your business. You have to focus on your core audience when planning your new product launch. Talk to them — and only them — in a way which they can relate. Your target audience(s) will give your product launch the momentum it needs to succeed. After the initial excitement, the rest will come to you easier, and you’ll see more sales. It doesn’t matter whether you are selling a physical product or a service; a launch event can give you the initial boost that you need. Get in touch with your state or city business department and find out if there are any empty premises available. Look for something striking, perhaps with exposed brickwork or beautiful features. Contact your local steel suppliers to find surplus floor plates for a modern, urban look. They’re good for safety, look fantastic, and can lead people straight into your main sales area. Let the local press know, and invite all your friends, family, and social networks. Hire a local DJ to set the mood, and a caterer to provide hors d’oeuvres. It’s amazing what a little music and food can do for an event! The bigger buzz you create for your event, the bigger buzz there will be about your product. A launch night is all about adding that extra bit of pizzazz. My final suggestion is to entice people to take action. You should be doing this as early as possible in the process. Advertise your product online, and let people know when they can expect to see it. Encourage them to sign up by offering them a better deal — 25% off for example — if they give you their email address. Keep in touch with them and offer early access to anyone that wants it. Or you could give away early or exclusive access as a prize to help drum up even more excitement ahead of your launch. Early adopters are always eager to try new products and spread the word to their social circles. As you get closer to launch day, ramp up their interest with more frequent emails. Don’t overdo it, though. When the big day arrives, relax and enjoy the culmination of your efforts. Best of luck with your new launches, and let us know how your big day goes! What tip(s) would you add for a successful product launch? What has been your favorite product launch to date (by you or another brand)? p.s. Are you planning on launching a new product or service? Let’s discuss a plan to make your big day a success! Two games in, and my bracket’s already busted. Oh hey, welcome to the CCC blog. I’m trying to sneak in some work today around the NCAA Men’s Tournament games. Sound familiar? 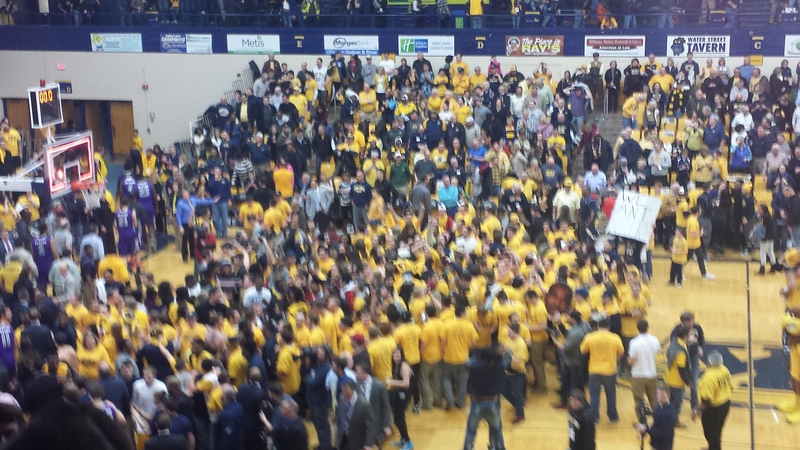 Fans storm the court as Kent State beats rival Akron for the MAC East crown. March Madness. As a basketball fan, sports junkie or gambler, you love it. As a business owner or manager, you may hate it. How do you make the most of this productivity black hole? Embrace the excitement. Approximately 40 million Americans will fill out more than 70 million brackets in 2015. * If you try to keep it out of the office, you’re missing out on the excitement it creates. Have an office pool, and encourage employees to display their brackets with pride. Have a “Tip-Off” party to commemorate the start of the tournament, complete with a basketball day luncheon of hot dogs or coneys, chips, nachos, other finger foods and all the trimmings. Bring the competition into your business. Hold contests for your various departments (most sales, most billings processed, highest amount of collections, etc. ), and utilize the bracket format. Who’s going to #SurviveandAdvance to the next round? Recognize round winners, underdogs succeeding, MVPs, and of course, overall winners. Give meaningful prizes, such as a day off, lunch at a nice restaurant or coveted branded swag. Create a winning atmosphere. Beyond just displaying their brackets, encourage employees (or departments) to decorate their workspaces. Team paraphernalia, #1 foam hands and motivational sayings are all great ways to get in the spirit. If possible, allow employees to dress the part with their favorite team apparel. Allowing dress down days during a fun event doesn’t cost you anything but is appreciated by employees. Take your efforts one step farther by handing out basketball-themed promotional items complete with your brand. Branded water bottles, basketball stress relievers and rally towels are fun items that recipients can continue to use long after March Madness is gone. Offer higher end items, such as a tone-on-tone embroidered pullover, to contest winners. Embracing the spirit of March Madness is a win-win. Your employees are happy yet still productive, and you end up on the right end of the final score. How has your company embraced March Madness? Who do you have cutting down the nets on your bracket? Who’s your favorite college basketball team? p.s. If you need any marketing, writing or social media help while you’re enjoying March Madness, we’ll be your biggest fan! Branding. It’s all the rage, but what is it exactly? According to Merriam-Webster, branding is the promoting of a product or service by identifying it with a particular brand. Of course, there’s as many definitions of branding as there are flavors of chewing gum. A few of my favorite things — Starbucks espresso, Chuck Taylor shoes and Merona socks. I’ll make it easy though. Branding is a feeling you create in people, an emotion. It’s the way that seeing a Starbucks cafe makes me smile. Sure, I’m an espresso junkie, but that’s not the only reason I love Starbucks. It’s the atmosphere in the company’s cafes, the best reward program in the industry. It’s my personal Starbucks cup, paying with my phone and earning stars, all while doing what I love — drinking espresso. 17 years ago, Garth put a kid from an unincorporated village 10 rows from the stage, convincing me that dreams do come true. Almost 17 years later, the love affair continues. And then there’s Garth. It’s not just my country roots or my cowboy brother who turned me onto his music. When you go watch Garth Brooks perform, it’s an experience, not just a concert. And 17 long years ago, he signed this fan up for life with a gesture that he repeated over and over again. He took the time to look at his show from his fans’ point of view and came up with ways to make their experience even better. And this fan will never forget it. How did they make a special connection with you? As a brand, how can you connect with customers? When the Livestrong Foundation (formerly known as the Lance Armstrong Foundation) launched the iconic yellow silicone wristband in 2004 as a fundraising initiative, I hoped it would raise some money for a worthy cause. I had no idea that it would catch on across the country — and around the world — as one of the hottest promotional products around. To date, over 80 million Livestrong bands have been sold, inspiring countless other charitable organizations, companies and brands to share their message in this popular manner. Silicone wristbands are so popular even Elvis has his eye on them. Like so many others, I thought this trend would never last. Who would want to wear these promotional wristbands? Nearly everyone, it turns out. From young to old and red to blue, people of all ages, nationalities, genders, political beliefs and lifestyles want to rock a wristband. That’s one of many reasons the silicone wristband is here to stay. Ten years later, this staple promotional product is produced in a plethora of colors promoting metro parks to marathons and everything in between. All of these factors can affect your pricing, and different options make sense for different objectives. In addition to exposure, silicone wristbands are also helpful at events. Hand them out to attendees at concerts, conferences and sporting events to easily identify who should be admitted and who shouldn’t. They’re durable, easily spotted and can be kept long after the event for continued exposure and as a keepsake. Whatever your message is, it’ll go far on a silicone wristband. What silicone wristbands are in your collection? Are you surprised at this product’s staying power or did you think it would be a hit? 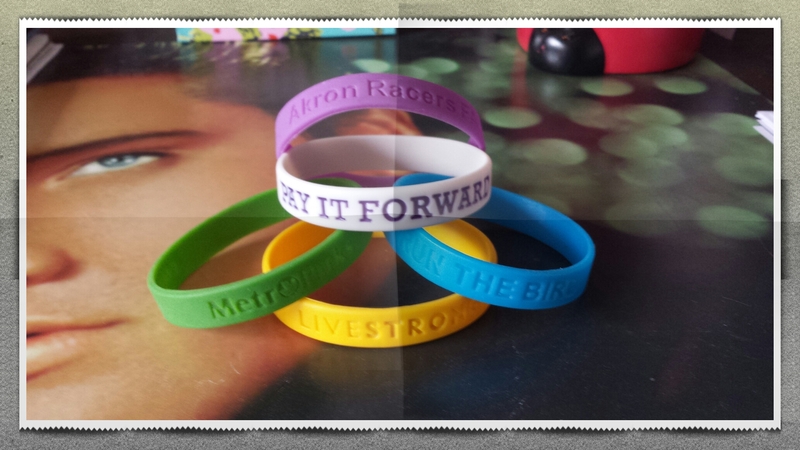 When did you get your first silicone wristband? Have you promoted your brand, company, cause, organization or event with one? We don’t have wristbands, but we do have social networks. Connect with CCC! CCC is excited to welcome Jasmine from GadgetsFactory.com, who is sharing her insight on the effectiveness of promotional products as marketing tools. Enjoy! Promotional products are considered powerful marketing tools because they can attract or gain the attention of potential customers in more efficient and inexpensive ways than other forms of advertising. Your company logo becomes more recognizable when people see it on products that are being used by several different people. USB drives can be an effective way to promote your brand. One reason for their effectiveness is the utility that these products can offer to recipients. People will likely appreciate them and use them on a regular basis, so they are considered gifts and not just product advertisements. Other benefits of promotional products are their cost (especially per impression) and ability to be customized. Depending on the item and quantity purchased, costs for your order can be held in check so you don’t have to commit your entire marketing budget to one project. These items can also be easily customized to add different logos, brand names or company slogans at a very reasonable cost. With that in mind, you can be sure that your marketing dollars will not go to waste. Promotions and endorsement work in two ways with promotional products. First, receiving branded products motivates recipients to support the company who gave them the product. The next time recipients need your products or services, they’ll be more likely to remember you. Branded promotional products also do an excellent job of creating awareness and informing people about new goods or services. As recipients use the promotional item (or pass it along to a friend or co-worker), they’ll likely refer your company to others (verbally or just by using the branded item). Basically, your recipients will do the marketing for you. Remember, people are more likely to listen to product and company recommendations from friends, family, co-workers or others they’re acquainted with. If your promotional products impress people, recipients will be happy to let people know about your company. Items such as custom USB drives and other technology products and accessories have become popular today and are generally well received. These products work well with newer gadgets or electronic devices, so people are usually familiar with them. If you’re trying to stick to a budget, don’t assume that technology products are out of reach. Accessories can lower the cost and still reach your desired audience. Branding is a buzz word today, so everyone wants to drop it like the name of the hottest new rapper out there. While it’s overused and abused, it’s still an instrumental element to companies and people everywhere. We’re all brands, you and me, Apple and Google. Living, breathing entities that customers and fans connect with, get to know and enter into relationships with. Sound strange? OK, think about why you buy an iPhone instead of another smartphone or why you choose Google over Bing. It may be a subconscious choice, but it’s not likely random. Apple has designed a brand with staying power. Of course, some brands get it more than others. The aforementioned Apple is one of the strongest brands alive today, and this is coming from an Android fan. I came across a blog post by Danny Trizio, marketing campaign manager at Proforma, touching on why Apple ‘gets it,’ so I’ll let him explain. Along with the tech icon, another brand who forges a deep bond with customers is ABSOLUT. (Full disclosure: I am a customer!) I previously offered a toast to this icon for its fine take on branding. Keep in mind that it’s not only industry leaders who can develop strong brands. While I’m a fan (and heavy user) of Starbucks, I also love our local spot, Angel Falls Coffee Company. It’s located in a neighborhood with a unique flavor that loves to support mom and pop shops. Angel Falls embraces its role as a local favorite, with an eclectic spot that welcomes you in to play some checkers, discuss current events or people watch while enjoying its brew (and a delicious, fresh out of the oven baked good). So how can I bond with two brands in the same industry? First, as previously noted on this blog, I’m an espresso addict. Second, I patronize both of these companies on different occasions. I love to walk to Angel Falls to enjoy a steaming GingerBeast (relax, it’s only a gingerbread latte) while catching up with a friend or gazing out the front picture window, lost in thought. Starbucks is a different breed. It’s everywhere, so I can stop in for a mouth-watering soy hazelnut macchiato, breakfast sandwich or old fashioned glazed doughnut whenever I want. The breakfast sandwiches are available all day, so it’s perfectly OK if I want breakfast for dinner or am really slow moving on a lazy Sunday. I can meet business associates or customers there to discuss projects while enjoying the breeze on the patio. One of the main reasons I became a Starbucks fan is the company’s prevalence in airports. I could grab an espresso and Perfect Oatmeal (which fits neatly on top of a lidded Starbucks cup, by the way) en route to my connecting flight at 7am. Haven’t we all been there?! Now that I’m not traveling so much, I find that I love hitting up my local Starbucks, which makes every effort to fit into the community. Its baristas are some of the happiest people I see all day, the atmosphere is conducive to thinking (which I like to do) and this coffee giant’s reward program is phenomenal. I was pretty excited when I received my gold card in the mail this week. Brightened up my Monday! So, who are some of your favorite brands? Who ‘gets’ the power of branding? Did I miss the boat on any brand I referenced above? Who did I miss? I’m not a political junkie, but I do consider myself a well-informed voter. I vote for each candidate individually, not strictly along party lines, and actually put some time and thought into my decisions. Throw in the fact that I’m an advertising major, and you probably figure I can’t get enough of the campaign season. Right? Wrong. When I cast my ballot today, I not only felt a sense of pride about participating in the electoral process, but also a sense of relief that the annoying attack ads, endless array of (bad) direct mail pieces and make-my-head-explode robo calls would be coming to a halt. I love America, but sometimes I swear political campaigns are the least effective advertising anywhere. Surprisingly, there are actually some good strategies to follow coming out of political advertising, and of course, there are other strategies going on that you should run away from as fast as you can. Below are five takeaways — good and bad — from the political advertising machine. 82.6% of people can recall the company and brand on their promotional product and 50% have a favorable impression of the advertiser. To take it further, 83% of people like promotional products and 58% keep them for one year or longer. How’s that for effective? 2) DO Collaborate/Partner –> Find companies with similar audiences to spread the love, cut costs and increase exposure. For example, the Akron Public Schools (APS) had a new levy on the ballot, which they desperately needed passed. They worked with a popular local race (the Project Homeless Connect 10k & 5k) to further promote their cause. An eye-catching direct mail piece that explained exactly how the levy would benefit students was included in each runner’s swag bag (no mailing costs), and the race director spoke favorably of the levy during the awards presentation. In addition to attaching itself to a great cause, the APS touched hundreds of members of its target audience at one time with only a small expense (printing costs). 3) DON’T Spam –> For some of the races, I did some additional research before figuring out who I was voting for. When I received direct mail pieces from these candidates, I kept them to look over later. When I dug them out the night before the election, I couldn’t believe how many duplicates I had received of the exact same pieces. Not only is this not at all cost effective, it doesn’t impress many people. If you’re going to really utilize one form of advertising, at least mix it up. One judge in particular stood out because her pieces were all different, including letters of recommendation from others, examples of her past success and highlighting different reasons why she was worthy of your vote (instead of cramming everything onto one piece like an encyclopedia). Go figure, I ended up voting for her. 4) DON’T Attack –> One other note about the judge I mentioned in the previous example… She only spoke about herself – how she was positively impacting the community, past decisions on cases, etc. She never attacked the other candidate even though the other candidate (or excuse me, her party) attacked her. (The other candidate claimed complete ignorance of the attack ads. Yeah right.) Like most people, I want to hear why I should vote for you (or buy your product), not why your competitor’s lacking. If you’re talking about your competitor, then I’m assuming that you have nothing positive to tell me about yourself (or your company). 5) DO Be True to Yourself –> Once you develop your brand’s voice, tell its story. Don’t embellish, misrepresent facts or flat out lie to make your brand sound better. If you feel like you have to do that, then something is missing. As I was discussing all of the blatantly false political ads with another woman in the voting line, she made a great point. “I don’t lie,” she said. “When you lie, you have to remember what you said so that you can tell the same lie down the road. Just tell the truth; it’s so much easier.” That’s one thing we should all agree on. So I hope everyone voted today to make your voice heard. Go ahead and take some key points from the political advertising machine to market your company or brand better while lowering costs and collaborating more effectively. If you remember only one thing, don’t use robo calls. EVER. p.s. For more information on promotional products, visit http://www.promotionalproductswork.org/ or contact me. 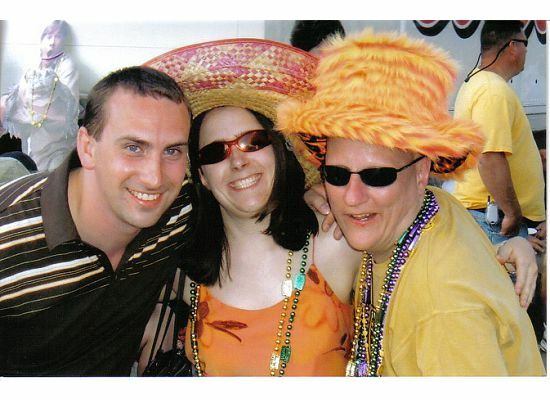 Fun times at the Kentucky Derby! It’s no surprise that fan is the root of fanatic. People are passionate about their sports teams, so why not make your brand an integral part? From game day giveaways to local team tie-ins, you can elicit as much passion about your company as the home team. Becoming a part of game day is a great way to get involved with the local community. Brand popular giveaways, such as noisemakers, signs, stadium cups or lanyards, to hand out at the gate or pre-game tailgating events. Help fans become the 12th man by giving away branded rally towels or shirts to create a ‘black-out’ effect – a sea of black across the stands (or use any team color). Shoot t-shirts with your company’s message into the stands during stops in the action to keep the passion and energy high. Not going to the game? Bring the excitement into the office. Make your employees the MVPs of a celebration honoring the local sports team or a season kickoff, complete with branded giveaways and merchandise. Pair this special day with a cook-off or potluck to foster team spirit and company pride within your organization. Reward winners or all participants with prizes to acknowledge their efforts. Giving branded merchandise to employees that they’ll use outside of work is an unobtrusive way to spread your message and potentially generate new business. Don’t limit creating fans of your company to the field or the office. Branching out into leisure time activities is an easy way to build rapport with potential customers, who are everywhere – shopping at stores, strolling parks, attending community festivals, etc. Sponsor teams or leagues, donate branded giveaways for fairs or partner with fellow local companies to create programs that will benefit the community and generate goodwill about your company at the same time. For example, a casual healthy eating restaurant could partner with a fitness center to promote healthy living. Both companies promote the program (and each other) by offering discounted products and services (15% off a fitness center registration with a receipt from the restaurant), helpful information (healthy living tips) and rewards to encourage participation (a free ‘healthy eating set’ after working out at the fitness center 10 times). Not only does partnering with other companies help promote your organization, it can also help with advertising costs. Split the cost of co-branded merchandise, so it’s a winning situation for both companies and the community.